In 2012 things were all up in the air for Canterbury law firms. Amid the chaos and ruin of this country's most devastating earthquake the people of Christchurch were vainly trying to rebuild their lives. Tremors that would have normally been considered 'big ones' became so common that people just ignored them. Basically, if things weren't falling down then there was no need to pay attention; in reality there wasn't much left to fall down anyway. That was the year of changes to the way legal aid was paid. The 'fixed fee' payment regime saw a huge number of law firms reduce how much legal aid work they provided. Erin Ebborn and Jarrod Coburn saw this as an opportunity and started Ebborn Law..
Central Christchurch was effectively destroyed by the 2011 quake, forcing law firms out into the suburbs. There were plenty of challenges setting up a business in the shadow of the Christchurch earthquakes, the main one being a lack of office space. After six months of planning the day was fast approaching where Erin was leaving her employer to start off on her own, but there was no office yet! Fortunately a call from the Harcourts peeps at the last minute saved the day, and the firm nestled in next to Mowatt and Beck Accountants, in Addington. The office was humble but in those days nobody cared too much - the whole city was munted and expectations were not high. Furniture and computer equipment was sourced through Smith Crane & Construction, who had been authorised to recondition and sell chattels from buildings being demolished. Thus Ebborn Law was born in a tiny sub-leased office with a total investment of $900 in recovered computers and office furniture. Never has a law firm cost so little and been so kind to the environment! Because the firm was new there was no 'baggage': no reliance on traditional methods. The vision was to build a law business that would represent a new way of thinking, to support access to justice and to show leadership to the wider profession. Policies and procedures were developed from scratch, based on Jarrod's experience in private enterprise and government. Fellow lawyers supported Erin, sending work her way, and the firm started to grow. Erin's focus was on people in need who came to lawyers for help and in achieving justice for them. She has always viewed justice is a basic human right and was committed to ensuring legal aid is available to those in need. This vision saw Ebborn Law became the South Island’s largest family legal aid provider just two years after its 2012 launch. It would go on to become one of the largest providers of legal aid in New Zealand the following year. 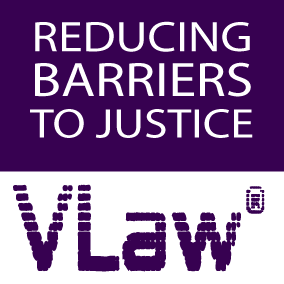 In 2014 Ebborn Law launched the VLaw® urgent portal for the Women's Refuge. The Ministry of Justice took an interest in this and sent an investigating officer from Wellington to assess the system. The feedback from the Ministry was overwhelmingly positive, with (then) general manager of legal aid services Michele McCreadie writing to say how impressed the Ministry was with the firm's innovative approach. The video links proved to be such a success it was very hard to keep up with demand. The opportunities this offered to Women's Refuges was incredible: previously many refuge workers would spend up to an hour or more on the phone trying to track down a lawyer for their clients. great fear to reach out for help. Yet the exodus from family legal aid in 2012 meant there were fewer lawyers who provided the service, and those who did were overwhelmed. It could sometimes take two or three weeks to get an appointment for an urgent protection order. Some refuges resorted to applying to the Court directly on behalf of their client - a risky activity for all. "We are impressed by the thoughtfulness and organisation that has gone into creating the VLaw system." when applying for a protection order. This meant the service needed to be available without delay, it had to be consistent so refuge workers could always trust they could access a lawyer, the lawyers needed to be empathetic to the situation of the client and the refuge worker. The service that was developed resulted in a promise to respond to a request for assistance within 15 minutes, a dedicated 'urgent' phone line for refuge workers to get legal clarification, a same-day turnaround time if possible, and a level of professional courtesy extended by lawyers to refuge workers. On top of this Ebborn Law provides training opportunities and pays for the cost of the video equipment. The setup at West Coast Women's Refuge in their Greymouth office. Refuge workers in Westport use a portable tablet device. "On behalf of the Canterbury family violence sector thank you for everything you and your staff have done over many years to promote safety, security and wellbeing and children and families in our community." Our flexible and enthusiastic approach saw a strong relationship develop with refuges - and it also impacted on social outcomes in provincial areas such as Kaikoura. With the increase in protection orders came additional MoJ funding for respondent programmes. In 2015 the firm was honoured by the Canterbury Family Violence Collaboration for services to the families of the region. The CFVC is an affiliation of CEOs and senior managers from agencies that deal with family violence, such as NZ Police, refuges, Ministry of Social Development, community services, etc. This recognition from the sector spurred Ebborn Law management and staff on to expand their services to refuges. Good business practice involves paying attention to many areas. These include understanding what good governance means and putting it into practice. It also includes accepting and implementing a governance and operational split that allows management the confidence and authority to act. Ebborn Law was led by Erin as the firm’s sole director and by the Chief Executive Officer, Jarrod Coburn. This represents a 'governance-operational split', which represents a clear separation of strategic and operational functions. The CEO is employed by the director, who delegates authority in all operational matters. Yet Erin is also the principal lawyer: in that role she works for the CEO, as this is an operational role. Faithful separation of her two roles is essential to ensuring the business runs smoothly. Lawyers who own law firms must by law also work in them, yet sadly many lawyers have a limited understanding of modern business management. Also problematic is a lawyer's natural aversion to taking risk. Traditional law firms sometimes employ practice managers but these employees usually have little or no sway over lawyers within the firm - they tend to focus more on the administrative staff. Since its start Ebborn Law has built a practice based on proven management theory with a focus on building a good workplace culture. These are two ways businesses such as Google and Amazon have grown and thrived. In Ebborn Law’s case effective use of technology is another important part of its business approach to running a good law firm. The firm’s use of VLaw®, allowing people to make contact by video link, is just one example of the technology Ebborn Law uses. Another is the use of document generation software and the JEMIMA™ practice management suite. The firm stopped using paper in early 2016 and has a strong focus on cybersecurity and data protection. An early investment in state-of-the-art hardware and software paid dividends both in terms of a reduced cost over the long term, and an increase in productivity. In 2017 another leap was taken with an investment in the LaserFiche content management system. Once fully implemented (due in the second half of 2018) this system will allow complete automation of many administrative functions, essentially removing the need to employ any legal support staff. conference, held in Auckland. During that time both Jarrod Coburn and Erin Ebborn have addressed the delegates, participated in panel discussions and assisted with the organisation of the event. In 2018 the company sponsored the 'Portia Cup', awarded to the university who wins the annual Great LawFest Debate. Warrick McLean, CEO of Coleman Greig Lawyers Sydney, with the Portia Cup at LawFest 2018.